Did you know that unless it is premixed, asphalt sealer purchased from a manufacturer is not ready for application? To prepare the sealer, asphalt contractors should add water, silica sand and an additive for the highest results. Aegis Asphalt Sealcoating uses Green Diamond sand mined in Riddle, Oregon. Green Diamond Sand is crushed, screened and rated in sieve sizes. Depending on the project, we will use a 30/60 or 30/50 aggregate size, which both show excellent results. Green Diamond sand is a hard, durable aggregate. Its green, shiny color adds a “sparkle” to the sealed surface. Asphalt sealer without sand is very slippery. People and vehicles will tend to slip on the pavement even with the slightest amount of water. It is not uncommon for lawsuits against property owners and asphalt contractors to arise in cases of injury due to pavement sealed without sand. Latex additive also has numerous benefits. Asphalt contractors should ask their sealer manufacturer or supplier for recommended additives based on the specific application. 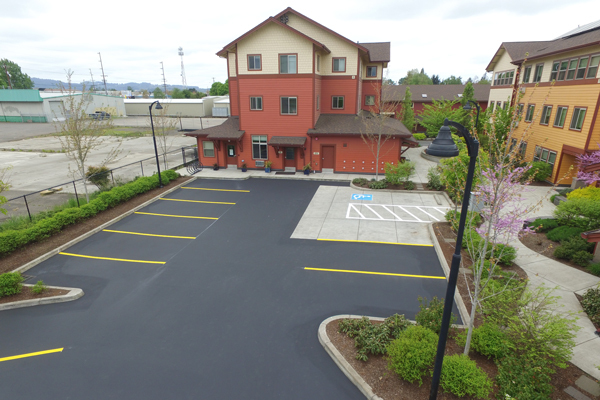 Aegis provides asphalt sealcoating in Eugene, Springfield, Roseburg and Coos Bay. Contact our expert team to learn more about our services.